Just in case the ranges and everything aren’t clear, TIE Fighter 1 has a range 1 shot on Z-95 33, TIE Fighter 2 has a range 2 shot on Z-95 33. Z-95 33 has a range 1 shot on TIE Fighter 1. And, Z-95 34 has a range 2 shot on both TIE Fighter 1 and 2. Let’s start with the first one, since this is probably the more obvious. Ships with fewer options should shoot earlier. This is because you may end up killing the target and leaving one of your ships without anyone to shoot at that turn. Z-95 34 could shoot at and (maybe) kill TF 1. If he does so, Z-95 33 has no shots. Treat this like elementary school soccer and make sure everyone has a chance to play. If we reverse the order and Z-95 33 shoots first. If he does not kill TF 1, Z-95 34 can follow up and try to get the kill. But if he does kill TF 1, Z-95 34 can then shoot at TF 2. Great roll, right? It would be if you got the order right. The Z-95 rolls Evade-Blank, and loses his two shields. TF 2 follows up with Hit-Blank. Z-95 rolls Blank-Blank, and takes 1 hull damage. Now reverse the order. TF 2 gets 1 hit through and strips 1 shield. Then TF 1 shoots, gets the second shield and lands a crit. The crit is the difference between TF 2 shooting first and TF 1 shooting first. This is why I say stronger ships should shoot later. Or more specifically, ships with a better chance of rolling a crit should shoot later. The idea might not be immediately obvious, but once you think about it, it should make sense. 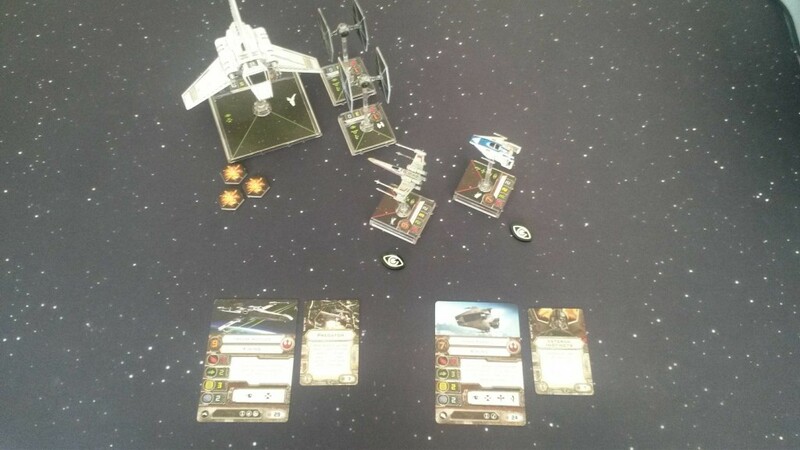 You don’t want to waste a crit taking out a shield, or in the case of TIE Fighters, taking out their Evade tokens. Have your weaker attackers chip away at the defenses, then let the bigger guns come through at the end. There are however (at least) two exceptions to this. The first is Heavy Laser Cannons. Since they can’t land crits, they should be shooting earlier. The second exception is when there’s a clear combination of overkill and underkill. Consider this scenario: Since it might be hard to see what’s going on, we’ve got Wedge with Predator and Jake Farrell with Veteran Instincts. Both are PS9 and both have a Focus token. The primary target is this shuttle (assume it’s got Vader), which is out of shields and has taken 3 hull damage. Wedge has a range 1 shot, Jake has range 2. To put this pretty simply: Jake is unlikely to kill the Shuttle, and Wedge is extremely likely to kill the Shuttle. Jake needs both dice to come up with hits and for the Shuttle to roll 0 evades. Wedge just needs to land 2 out of 4 hits (with the Predator reroll), and the Shuttle doesn’t get to evade because of Wedge’s pilot ability. So, Jake shooting at the shuttle is a waste. The best option is for Wedge to shoot first, and should things go very poorly for him (I’ve seen it happen), Jake can try to follow up to finish the job. Definitely do not have Jake shoot at a TIE Fighter before Wedge has shot at the Shuttle. These kinds of exceptions aren’t that common, and if you’re a newer player you should mostly just focus on the two main ideas. Let your ships at range 3 take shots before the range 2 or range 1 ships. Let your ships that didn’t get a Focus or Target Lock this round shoot before the ships that do have modified attack dice. And think through the possible outcomes of each shot to make sure you’re not leaving a pilot with a wasted turn. 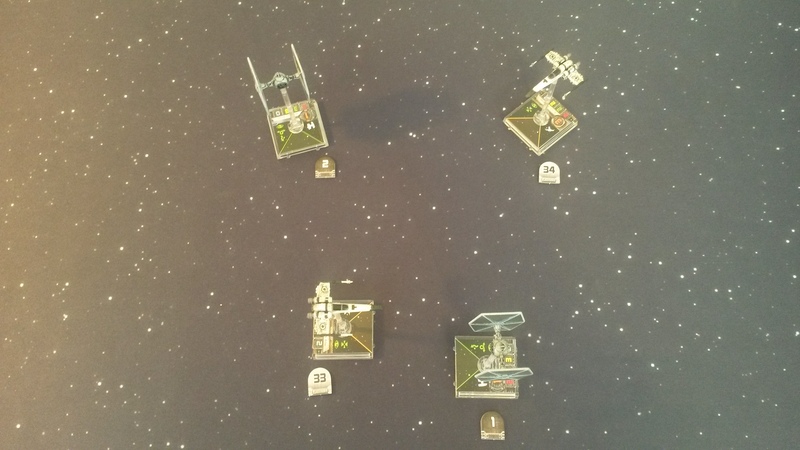 And as with most concepts in X-Wing, the best way to learn is to fly more and get experience. Nothing really drives home a lesson quite like seeing your efforts go to waste.